Handmade items, whether they are quilts, bags, yarn items or garments, need to be labeled! Someone ( presumably you) spent money for the raw materials, time to create those items and probably added in some blood (true story), sweat and a few tears in the process. 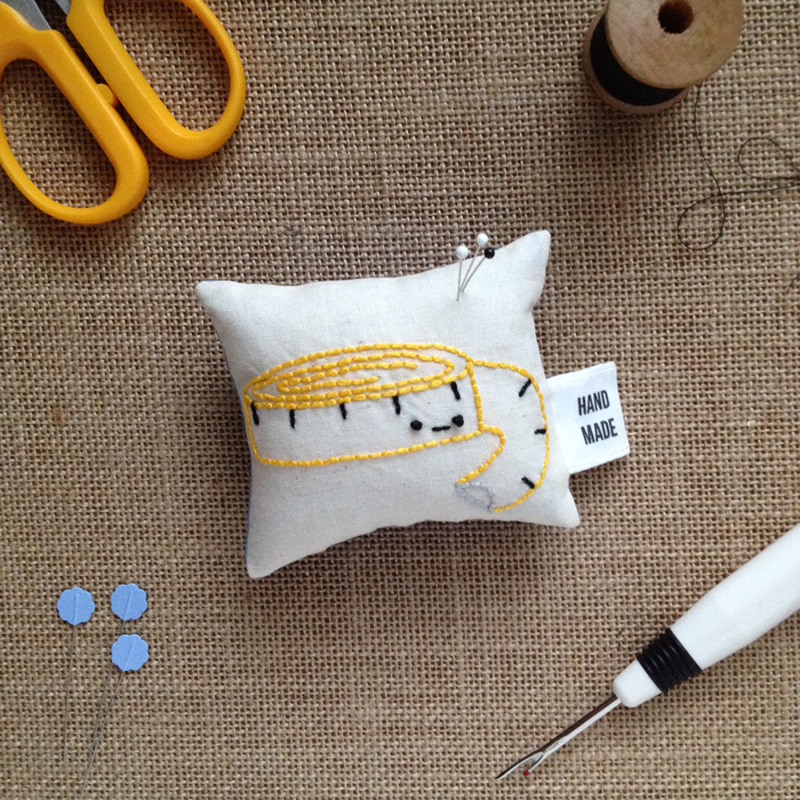 We all know that handmade items are not cheap or poorly made. They are a true labor of love! Yet so many of us forget to or overlook labeling our work! My hand is WAY up in the air on this one! Monday Motivation is labels you can make for free ( or very low cost) that will help to make this step a little easier! Martingale has these free printable labels and tips for how to print on fabric by visiting here. Sew Can She has free printable that can be printed on fusible interfacing to create a label. 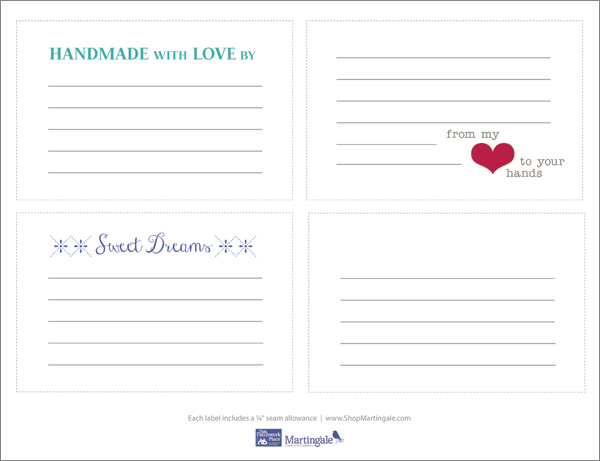 Find her downloadable pdf and tutorial here. 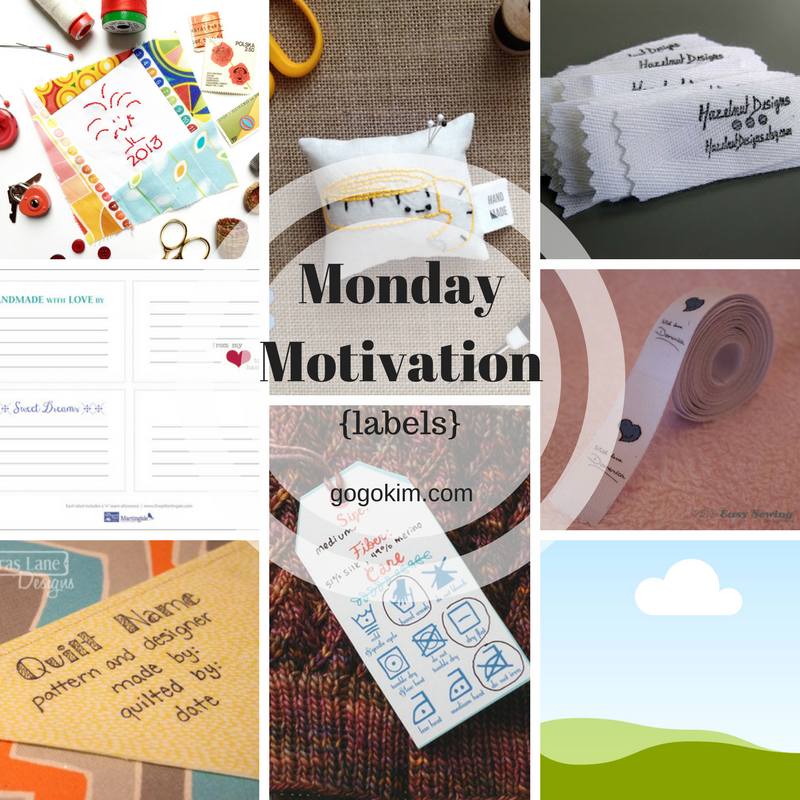 Simple and sweet is the label tutorial from Sassafrass Lane here. For crocheted items, this adorable label has room on the back for hand written care instructions by Cobberson & Co. here. 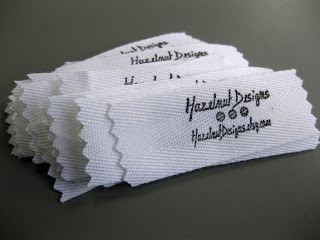 Easy Sewing for Beginners has a free tutorial here for how to make fabric labels for garments and other sewn items. 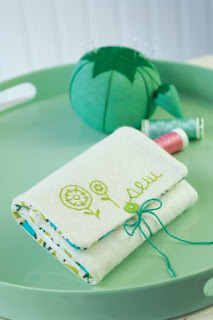 On the Spoonflower Blog here, There is a fun and free tutorial by Salty Oat on how to make fabric tags for handmade goods! 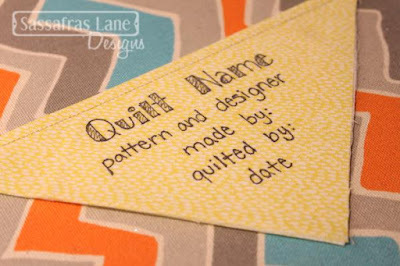 Pear Tree Stitching makes her lovely tags with a personalized stamp! Find out more by visiting here. 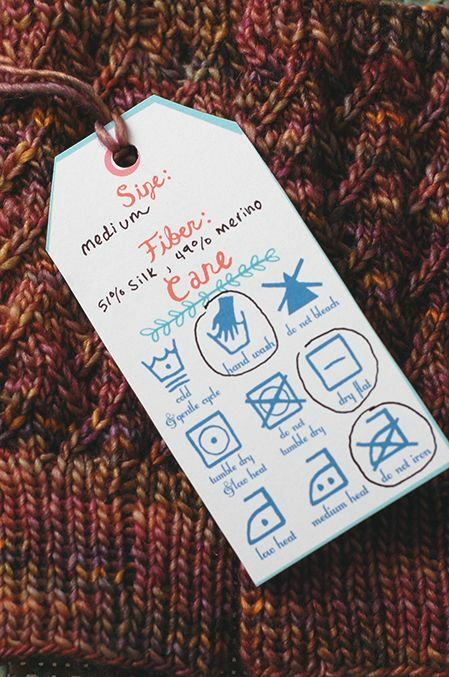 For knitted items, First Pancake Studio has these printable tags available here. The way I have been making mine is pretty simple. It is my drawing of me that I started when my older boys were little. I drew it on fabric and embroidered it using Aurifil thread. It is personal and...well...me! 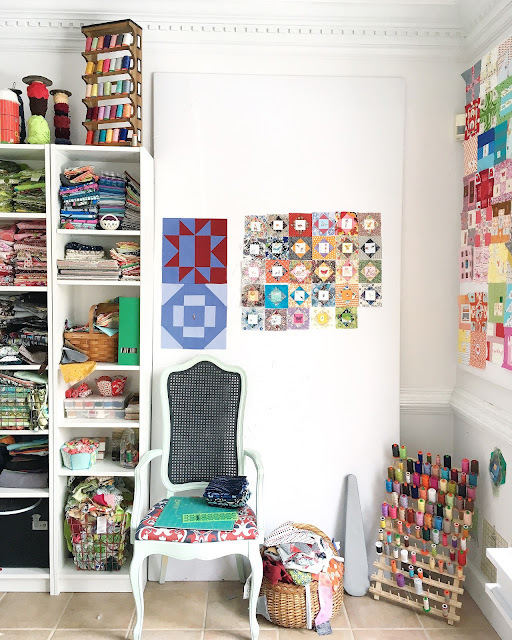 When I was invited by Jane to be part of The Splendid Sampler, I had no idea how incredible it would be! 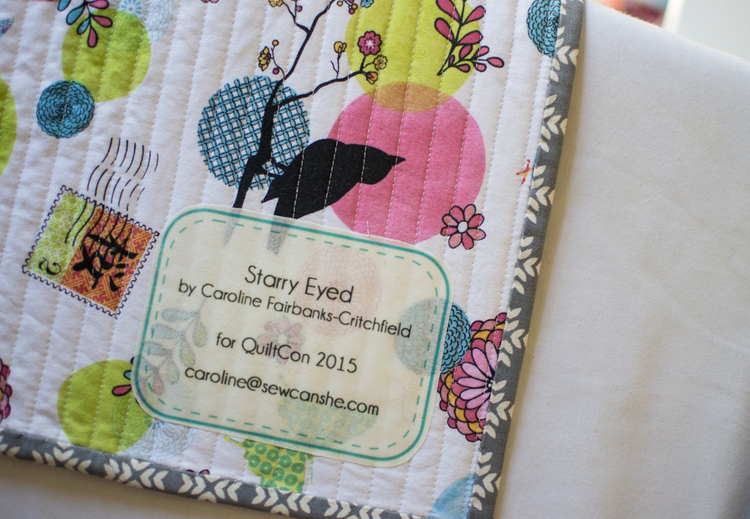 She came by the booth at Quilt Market and asked if I would be interested and I said, " Yes, that sounds like fun!" 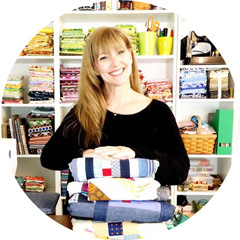 I have always been up for some good sewing fun! Some time passed and it was time to actually do the block. I had some ideas but went back to one block that I created to make a pencil pouch for my daughter Katy. 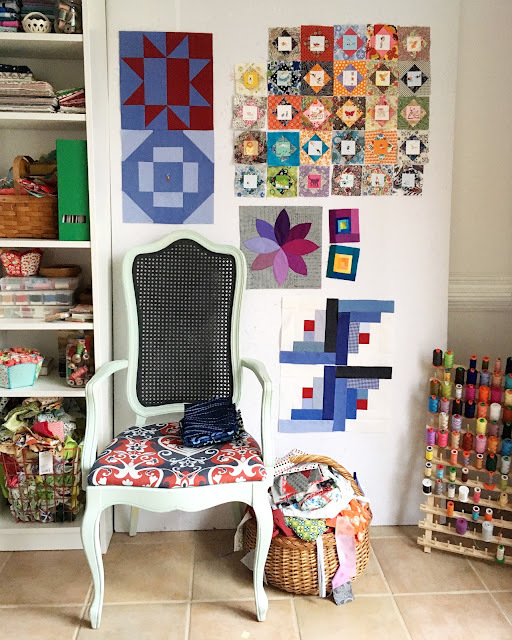 You can download The Splendid Sampler #95 Sunshine Block here. We have three sons and a daughter. The two older boys were born when I was in my 20's. I spent years being a mom to boys. I loved it! Trains, beach trips, The San Diego Zoo, parks with frogs and other amazing adventures. It was wonderful! In my 30's I went back to work as a full charge bookkeeper and our lives were very busy! Before I had boys, I thought I wanted a girl. After having them, I could not imagine life without boys! I never even realized that I wanted a little girl until my dear friend Emma had her first daughter, Evie. I ADORED Evie so much! So my heart strings were pulled a bit but there were no plans for another baby. The oldest was 11 and the youngest, at that time was 8. As often happens, a surprise! Everyone had tried to convinced me that the new ( SUPRISE) baby I was carrying was, in fact, a boy. Either way, I did not really care. I just wanted a healthy baby. And that is exactly was I received. To everyone's surprise, even mine, a red faced, dark haired tiny little person ( that just happened to also be female) was introduced into the world. I thought if I were to have a girl, I would cry. I did not. Instead I laughed by head off. When the Dr said " You have a baby girl!" I had him repeat it, since, you know, I could have completely heard him wrong with all of that pushing nonsense going on. I really was not sure what to do with her because...well...mom of boys here! But, in time she taught us. She is our Sunshine. I started sewing because of our youngest son but found that, after time, I was looking for projects to sew for Katy. 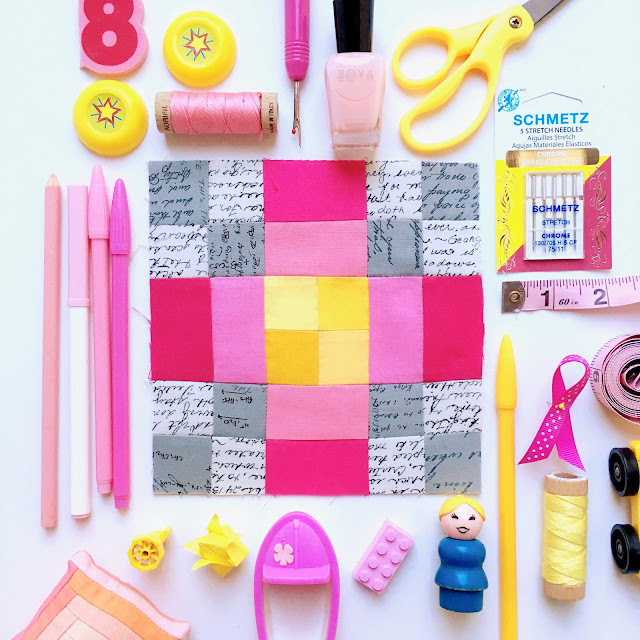 This Ticker Tape Quilt I made for her doll. I happened upon it when looking for props for the remake of the block. I though it was funny how the colors match the Sunshine Block! Every year since Katy started school after we moved to VA, I made her a new pencil pouch. The second year that I made her one, this is the block that I made. 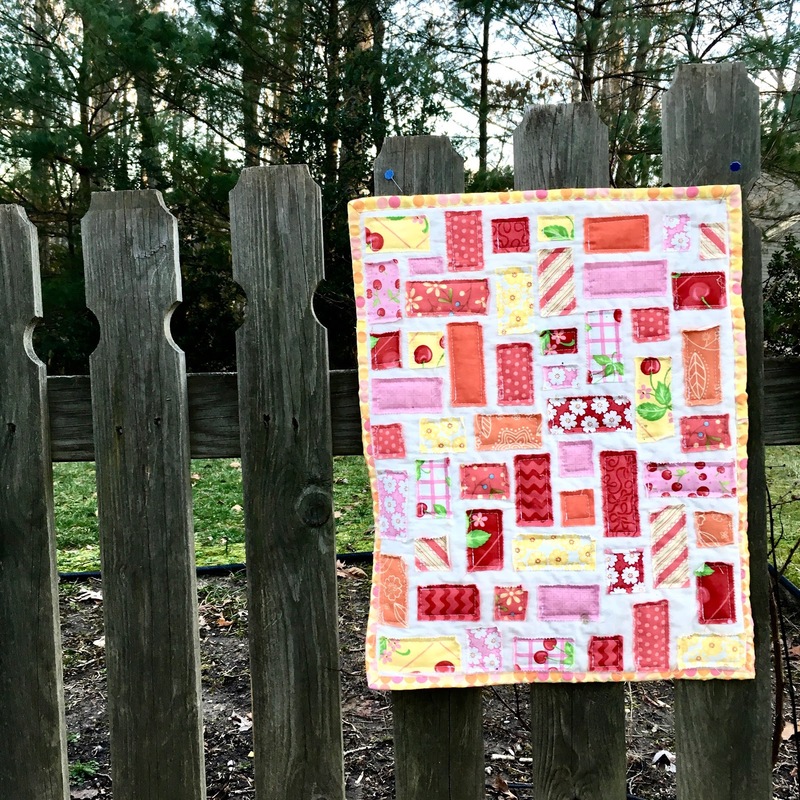 It was made using Tula Pink and Robert Kaufman Linen. I made it in 2012 and she still uses it. The Sunshine Block is from this one I designed for her case. 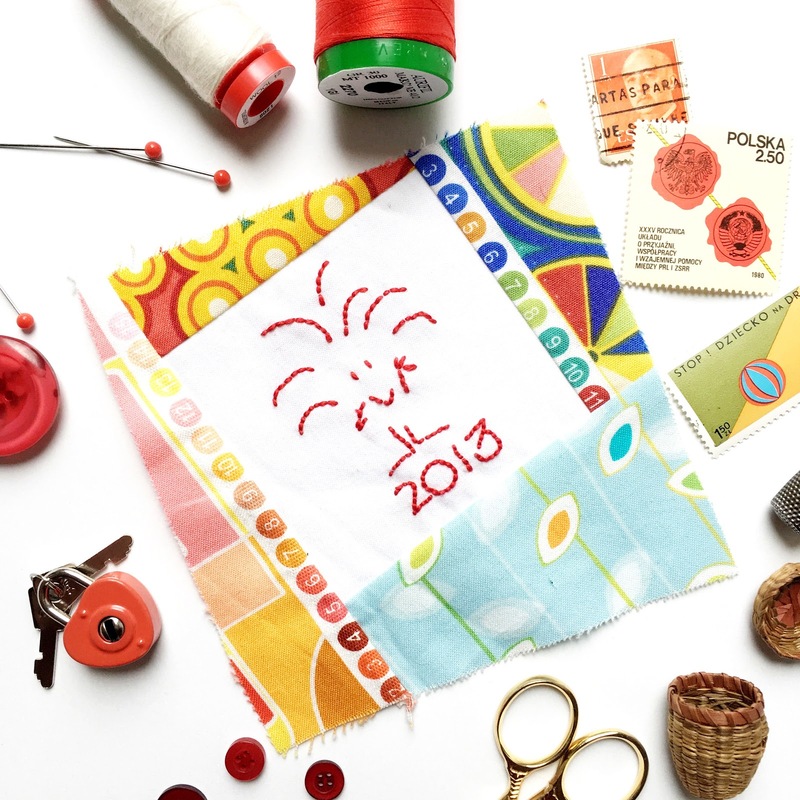 If you have been sewing along with The Splendid Sampler you have been learning so many was to sew using small pieces! 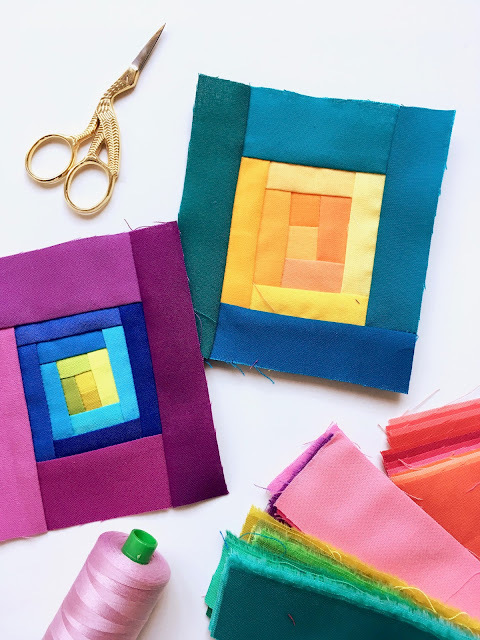 Many of the designers have had great tips and tricks for how to make the process easier and more proficient to get those perfect ( or almost perfect) blocks! Here is my tips for making more perfect nested block units. When I make tiny nested block units, I first cut them a little larger than necessary. Then I pin ( this is Sharon's tip that I LOVE) on the diagonal. After sewing the two units together, I press them and then trim to the necessary size. I used this for all of the four section blocks. Yesterday morning, I made a quilt video on Instagram to show how this method is awesome for getting perfect nested seams! I also use only Aurifil 50wt for piecing. 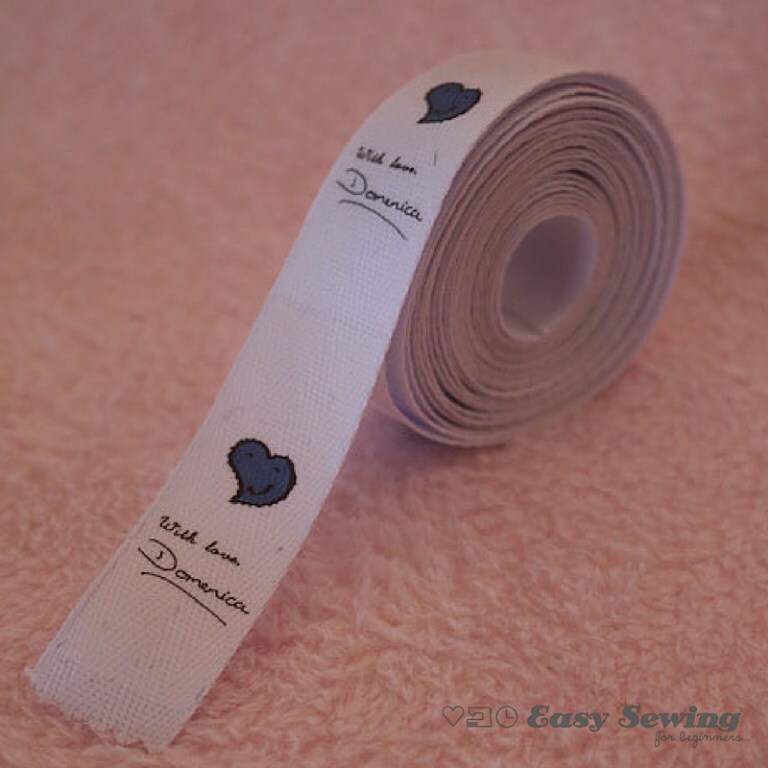 The thread is thin and makes your seam allowance perfect! 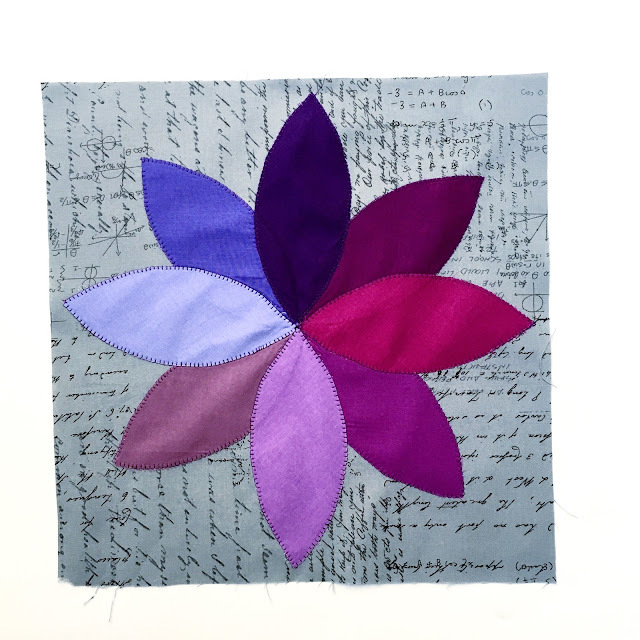 The Splendid Sampler has been the most fun for sewing and learning new techniques! Thank you so much for joining in!!! Pat and Jane, Thank you from the bottom of my heart for creating this remarkable event and all of the good that has come with it. Love you both so very much! Welcome back to Monday Motivation! 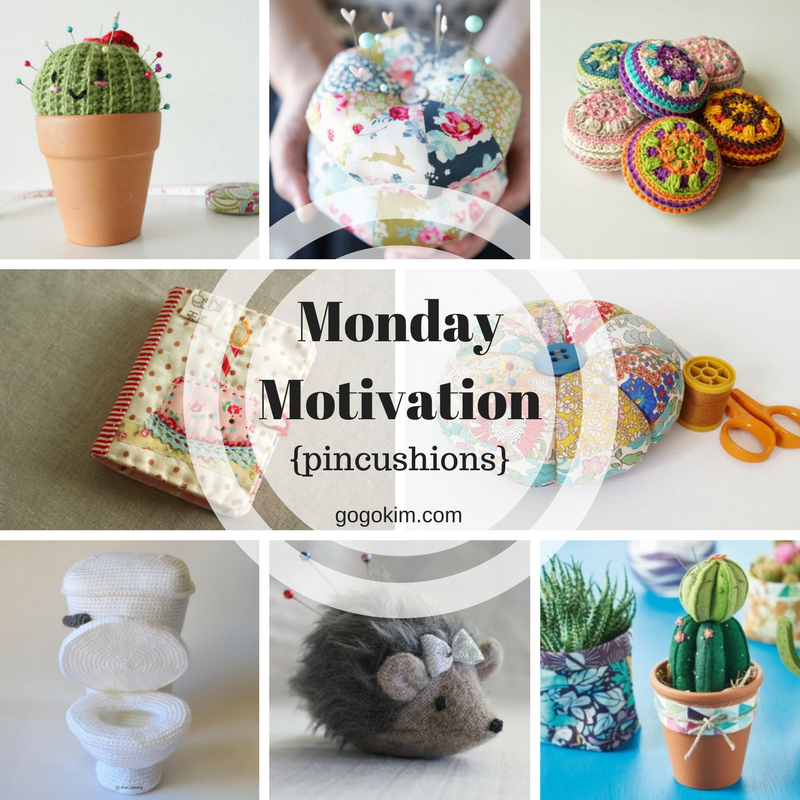 Every sewing room needs pincushions. My sewing room has at least a dozen, maybe more. But there is always room for more! 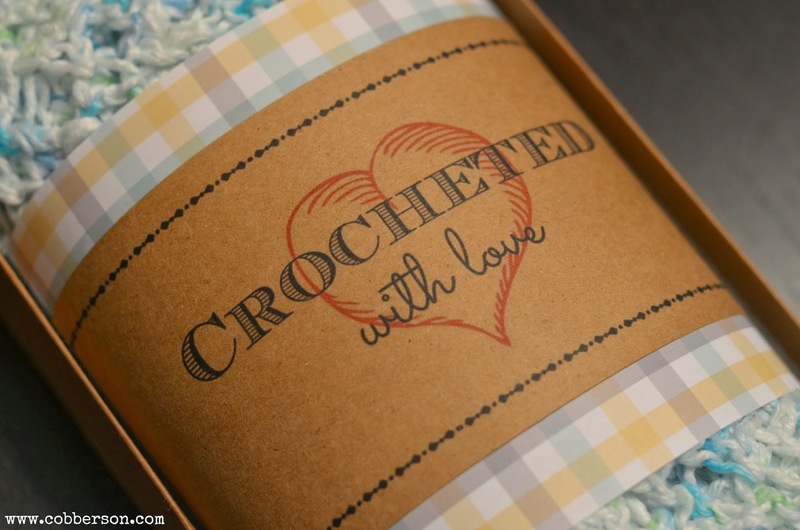 This collection includes patterns of all kinds from crochet to felt! This week Monday Motivation is pincushions! 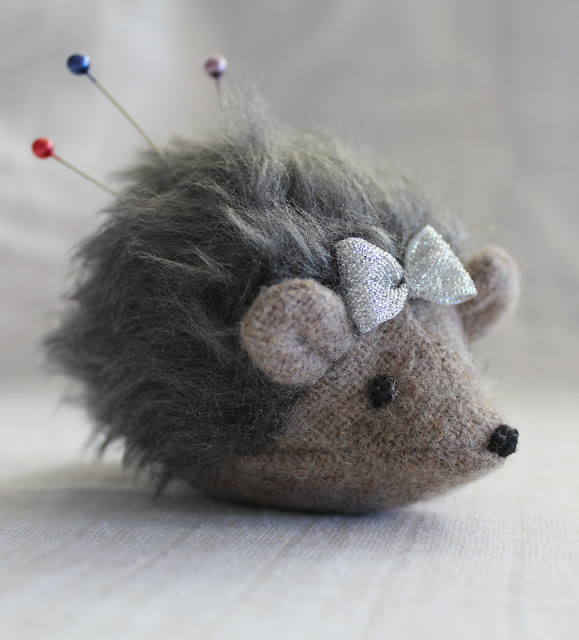 I LOVE this crocheted pincushion comes with a free pattern from Berta from Piparapip found here. 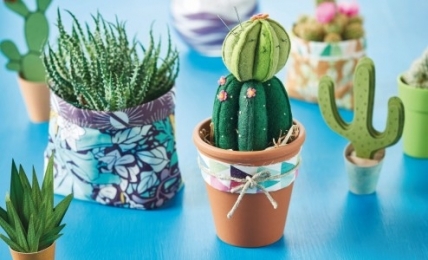 Another fun cactus pincushion is made from felt! This adorable pattern is by Carolyn Letten and available for free at Sew Style &Home here. 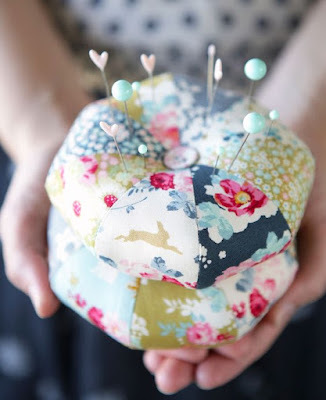 Tildas World has this very pretty pincushion complete with a template and tutorial found here. 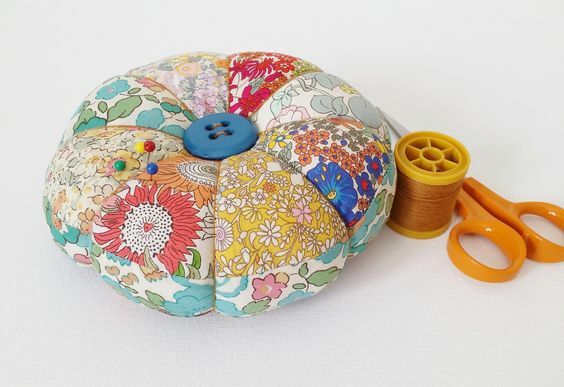 Liberty of London scraps make the BEST pincushions! Mad for Fabric has a wonderful pattern this pincushion found on her site here. 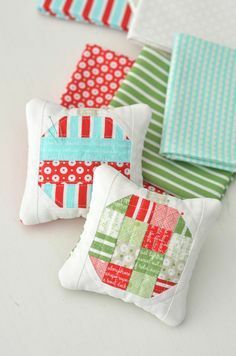 Camille Roskelley made this tutorial for a Christmas pincushion ( that can be used year round) for Bernina We All Sew here. 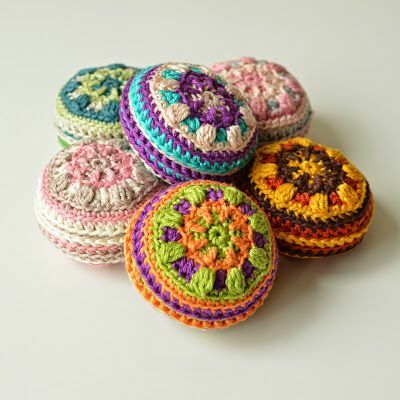 The Macaron crocheted pincushion by Tatsiana of Lilla Björn is a reason to grab your hook and some beautiful yarn! Find the free pattern here! 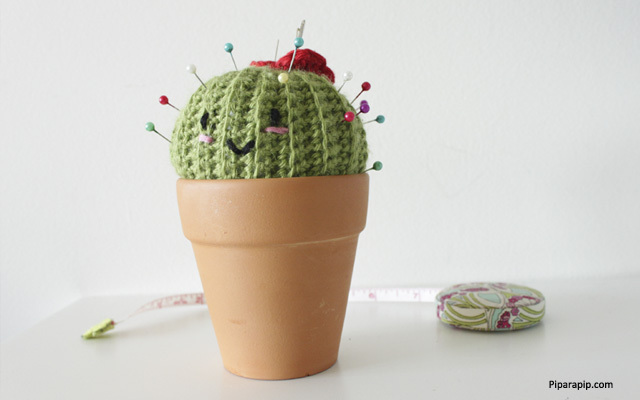 One more free crocheted pincushion pattern that I could not resist to share is by Kim Lapsley and is too much fun! I little more than I could manage but hysterically funny! Get the pattern here. Every sewing enthusiast also needs a sewing needle book. Amy from Nana Company created a sweet pattern here. 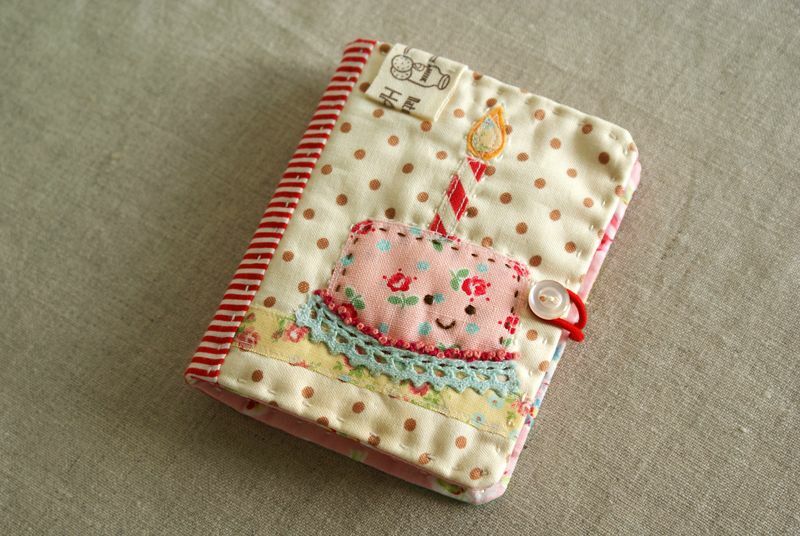 One more needle book and pattern featured on Stitch Craft Create here is made from felt. Finally is a hedgehog from Makerland. I want one of these just because it is too adorable for words! You can find the free pattern and tutorial here. This week for Sunday Stash is almost a zillion colors of Kona Cotton from Robert Kaufman! I bought these from Karie when she had a destash on Instagram. If you do not follow her feed on Instagram...do! She is one of the most wonderful people I have had the pleasure to meet in real life and she is LEGIT, talented and FUNNY! After playing around with some of the smaller pieces, my eye caught this stack of beauties! JUST SO PRETTY! It is Aurifil 2600! I finished off my cone last year and now have this one large spool left. It will last quite a long time so I am not worried about running out anytime soon. The grey will blend into just about every color. I will not use it on pure white or blackest black. Otherwise, I have never had an issue. 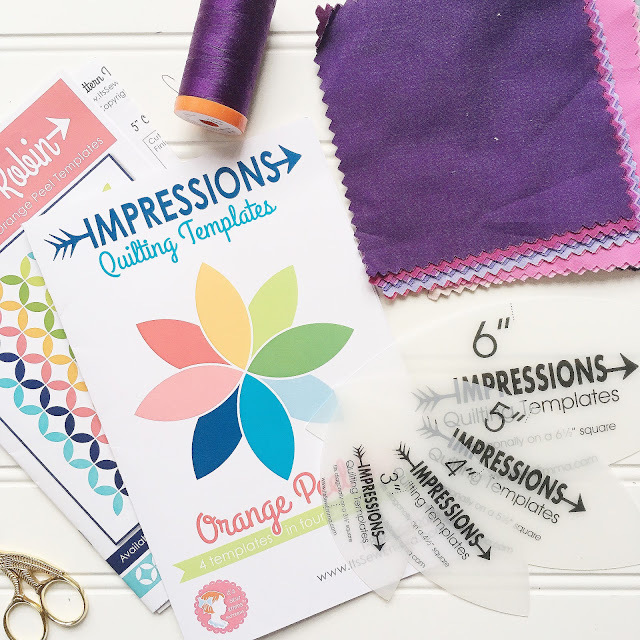 The Quilter's Planner has been having a fun event on Instagram for January using their 2017 planner but you can play along using any planner! Yesterday's prompt was Top Tip. The tip I shared is one that I do believe is important for everyone that sews! Thread and needle compatibility with the materials and thickness of the project being sewn. There are different weights ( thicknesses ) of threads and each has their recommended use(s). the same applies to needles. Some people have difficultly with their projects and look to their machine as the culprit. many times the issue is with not choosing the proper thread and needle weight/size. Our machines are everything! If it is not happy, we are not happy! 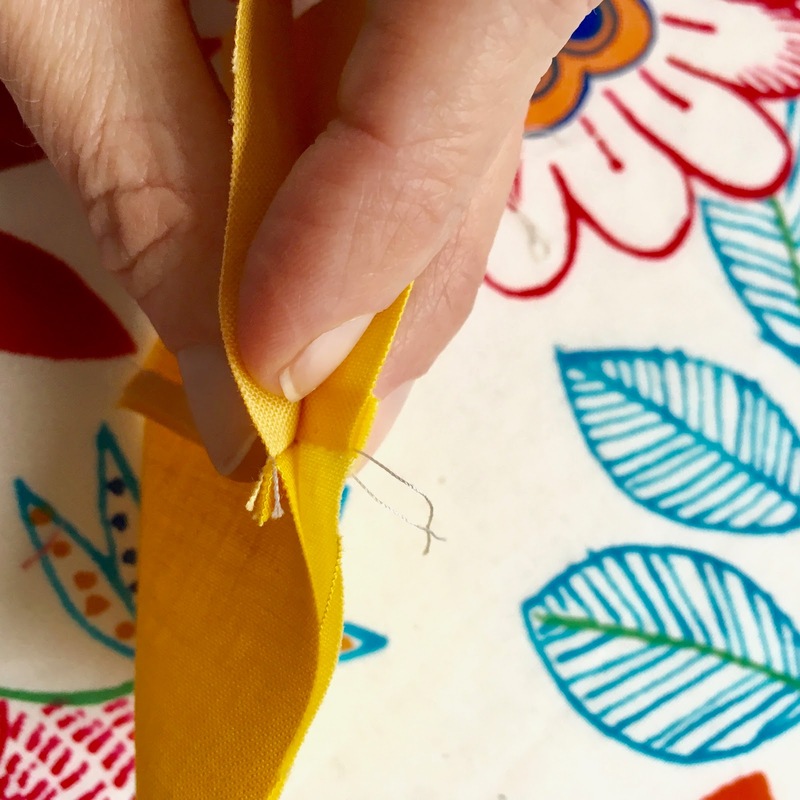 Choosing the right thread and the correct needle size will eliminate many "machine" issues and will also help your machine sew better LONGER! I wrote notes in my planner to help keep track of the Aurifil thread weights and needle weights. I use Schmetz needles for my machine sewing. Aurifil 12 wt, the red spools, is the thickest thread. It comes in both cotton ( mako) and wool ( lana). I have also used 12wt cotton for hand sewing buttons on my Cathedral Window Pincushions. This is a wonderful All Purpose Thread! Most importantly! BE ADVENTUROUS! 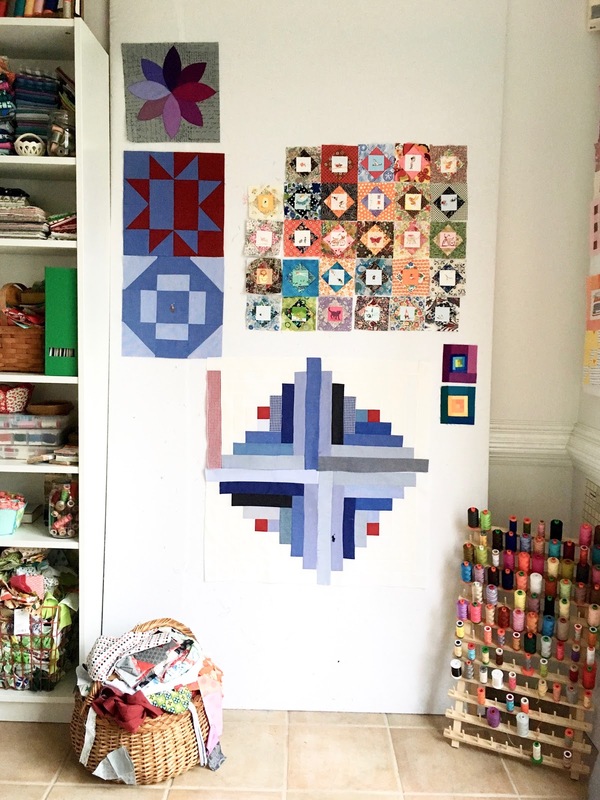 Make a 10x10 of what you want to try and give it a GO! I always make a sample to try out some old and new! There is also a wealth of information on the sticker on the bottom of the Aurifil spool! Here is a short tip clip on how to read the information on a spool to tell you all you need to know before you sew! After posting the photo of the @aurifilthread spools I realized it may be helpful to show you how much information is given on the sticker on the end of the spools!